Paragon Chat mostly tries to mimic the traditional COH slash commands that we're used to, but in some cases there are differences. It also has a few PC-specific commands that are new. Sends a private message. This shows up as a tell to other PC users, or as a direct instant message to someone using a standard XMPP client. Local chat. Sends to people within a 100' radius. This is implemented behind the scenes as multicast direct messaging, so it does not show up to people who have joined the zone's broadcast channel using XMPP. Either performs an emote animation if the name is found in emote.cfg, or sends to the emote text channel which functions exactly like /local but with a different chat bubble graphic. Request channel. Functionally identical to broadcast, but is a different color and can be sorted into a different chat tab. Sends a global friend request to the specified user. Paragon Chat users will get the familiar popup. XMPP users will be prompted in an application-specific way that someone wants to subscribe to their presence. This command does work with character names, too, if the character has been in zone with you recently enough for your client to remember their character name. Note that since character names aren't unique, you might not be friending the right person if there's a duplicate, so I recommend always using global names if possible. Removes a global friend without prompting. Joins or leaves a global channel. These are actually client-side commands, but listing them for completeness. Sends a message to a global channel that you are a member of. Sends a global channel invite. Not really very useful right now since Paragon Chat doesn't process incoming invites. Standard XMPP clients might, though. Changes costumes to the specified number. Instantly moves to a different map, see the wiki for a list of map ID numbers. Adds a player to your account-wide ignore list. Removes a player from your account-wide ignore list. Teleports you back to the zone entrance point. Manually sets the username, password, and optionally xmpp server to connect to. If no server is set, the appropriate server for your JID is determined by an SRV lookup, or failing that, a direct connection to the domain part of the JID. Setting these affect the next connection made by /xmpp_connect. These are normally not needed as this is handled automatically by the login form when you start Paragon Chat. Disconnects the active XMPP link. This will result in all other players disappearing and chat no longer functioning, though you can still use /mapmove and local-only features like tailors. Connects the XMPP link. Useful if you get disconnected. Manually associates a global name with a JID, overriding the automatic global name assignment, and saves it in your local database so that the JID always gets mapped to that @global. Removes the JID associated with the given global and removes it from database persistence. The next time the associated JID is seen, automatic global assignment will be used. Sets the name of the MUC (conference) service that Paragon Chat uses. This is normally automatically discovered for the xmpp server that you log into, but can be manually set if your server doesn't support discovery, or if you want to connect to a MUC on a different server than you logged in to. Does not take effect until you /mapmove to another zone. For advanced users only. Similar to /chanjoin, but allows you to manually specify the full JID of the XMPP room to associate with the channel. Possibly useful on servers with s2s federation enabled. Sends a channel invite to a full JID, otherwise works the same as /chan_invite. I am not finding a list of map ID numbers on any Wiki sites. Yessa! I am tinkering with the front page atm to add the newer stuff. Ya'll will see a new quadrant soonish! Yessa! I am tinkering with the front page atm to add the newer stuff. Ya'll will see a new quadrant soonTM! Sorry Ag, I couldn't resist. Technically, perdman44 has yet to ask a question. Also technically, no one has answered ziguzanuzoon's question, because the answer to that question is "yes." I don't know who came up with those map#s, but I'm sure glad they did. I was going crazy trying to find Faultline until it occurred to me to do a search for mapmove. If you want to get to Faultline 'legit', the easiest way is to go to Pocket D and use the manhole in the heroside lobby. The only other entrance is on the south side of Skyway, which is kind of a pain to get to without trams. Hi, does anyone know the commands for Costume Changes with effects? I've seen a few people initiate them. I was just curious if this was something we could all do with some kind of command like in the original game or is it some kind of editing workaround. A lot of people are experimenting with Paragon Chat right now, and I strongly suggest people interested in seeing what's possible look at the various Paragon Chat forums to see if someone is posting about something you're interested in right now. Thanks Arcana, I found this earlier was just about to edit my post with that link for others to check it out. I appreciate the reply. Tried it out, pretty amazing to see some kind of "powers"
That window is set untoggleable. You can try /disable2d 1 to clear all the windows, and disable2d 0 to get them back. Are there any slash commands to change the focused "channel members" list? i.e. 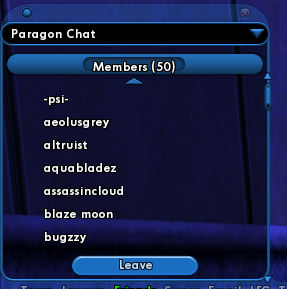 if I'm listing the default channel "Paragon Chat", switching to another channel member list without mouse clicking.